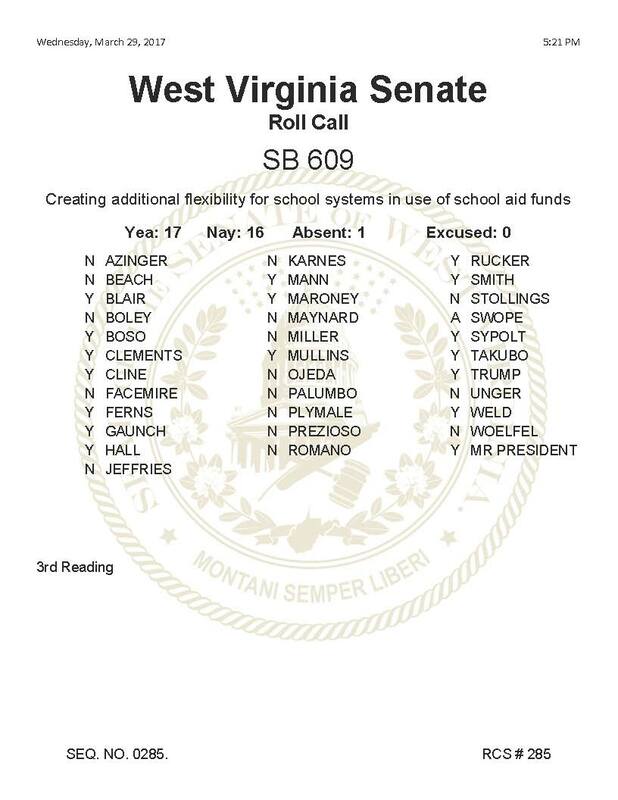 Senate Republicans narrowly passed SB 609, which would automatically raise every county’s property tax levy to the statutory maximum, and cut the state school aid funding by the amount raised. How much will your county lose? The move is a shell game to plug the state’s budget deficit — to the tune of $79.3 million - by forcing local county boards of education take the heat for the huge tax increase. 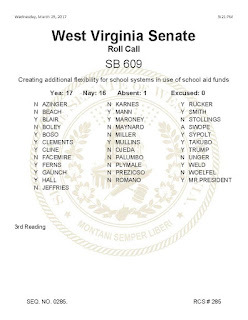 The bill gives counties the option to roll back the levy, but doing so would not restore the state cuts, leaving mammoth holes in local county and BOE budgets. The measure narrowly passed, 17-16. How did your Senator vote? “The money raised by the school levy stays, every dollar, with the county board of education,” insisted Sen. Charles Trump, R-Morgan. “It does affect, in an inverse way, the amount of money that the school aid formula suggests that we provide to school boards.” The increase in property taxes will fall hardest on the shoulders of our senior citizens and lower income families. Well, ok then. Sounds like a tax increase to us. What is causing our trade deficits? Both Bernie Sanders and Donald Trump are blaming “trade deals” for the loss of manufacturing jobs in the United States that so many of their supporters see as the root cause of their being “left behind” because wages have stagnated or even declined for what used to be the middle class. Bernie Sanders sees himself as some sort of visionary for casting votes against NAFTA and subsequent trade agreements. Trump argues that American negotiators were simply incompetent and allowed themselves to be bested by the Chinese and others. Both Sanders and Trump are dead wrong. The real causes of the economic situation we now have are quite different from what those candidates blame. They began decades before any of the trade agreements now being blamed were even contemplated. One of the most important of the actual causes dates from the 1950's and three others date from the late 1960's. Each of these has had more of an impact on the restructuring of the American economy and the changes in people’s relative economic status than all of the trade agreements combined. At the close of World War II, the United States had the only major industrial economy that had not been absolutely devastated by the war. Our wartime industries had ramped up to produce everything needed to win the war, often by stopping production of hundreds of kinds of consumer goods. When the war ended, we had a huge backlog of domestic demand as well as a huge demand from abroad for materials to re-build the economies of war-torn nations. We were running three shifts a day getting every ounce of production we could get out of factories built before and during the war. Meanwhile, the Europeans and Japanese were busy building new, more efficient industrial facilities to replace those destroyed by war; and the Third World was starting to actually develop industrial economies instead of merely producing raw materials. The entry of new producers meant that there was soon to be too much production capacity for some products, among them steel. Much of the new production came from factories that were more efficient than the American factories and paid their workers less. Their products could be sold for less than American-made products. For awhile, the non-European producers could not match the quality of American-made products, but they soon learned how to make products of competitive quality. The second of the causes was the collapse of attempts to create a system of monetary management among the major economic nations of the world. The Brettotn-Woods system was created in the later years of World War II to try to ensure that there would be a system of financial rules and institutions that would facilitate fair trade and other international relations. Parties included the U. S., western European nations, China, Australia, and, after the war ended, Germany and Japan. The idea was to tie the value of these major currencies to an agreed upon price of gold bullion ($35 per ounce) with the United States as guarantor of what was necessary to maintain flexibility and liquidity to faciltate trade and economic development. The fatal flaw of Bretton-Woods was the impossibility of maintaining a stable price of gold on the open bullion market. It was possible to accumulate dollars, trade 35 paper dollars for an ounce of gold, then sell that gold on the bullion market for much more than $35 an ounce. Other problems with Bretton-Woods created recessionary pressures within the U. S. economy that both the Kennedy and Johnson administrations tried, without much success, to address. In 1971, President Nixon unilaterally took the United States out of the system, allowing the American dollar to “float” against the value of other currencies of the world. Absent the United States’ participation, the Bretton-Woods system could not function. But in a condition of “floating” currencies, the relative strength of one currency against another affects the relative price of goods to consumers. A strong U. S. dollar causes American goods to be quite expensive when they are sold in countries with relatively weaker dollars. Conversely, goods made in countries with weak dollars should cost less when sold in the U. S., although the benefits of any lower cost may well go entirely to the importer rather than to the actual consumer. The third major problem is an outgrowth of the second. Some nations engage in currency manipulation to gain trade advantages. Currency manipulation involves a government buying or selling its own currency in order to change the exchange rate of its currency-what people get when they convert, for example, dollars into Euros. Artificially changing the exchange rate drive the currency’s value away from the equilibrium that would have been achieved by market forces alone. The object of manipulation is to be unfair to trading partners. In a lot of ways, currency manipulation is to business what point-shaving is to sports. For some time now, China and some other nations have believed that it is in their own national interest to manipulate currency to make their goods cheaper than comparable items made in other countries so that trading partners will buy more from them. For example, the Chinese government thinks this will stimulate demand for goods made in China and result in more jobs for their workers and more profits for their industries. Currency manipulation is actually independent of the terms of trade agreements, but it affects the results of trade agreements to the nations invovled. To continue the analogy to sports, point-shaving will affect a team’s win/loss record and possibly enrich team owners independently of league rules, the schedules agreed to by the teams, etc. The point-shaving effects can spill over into such things as where teams stand in the draft choices, player salaries, etc. Several well-designed and reputable studies have concluded that currency manipulation alone has cost the United States 5.8 million jobs and Canada millions more. The third of the 1960's era problems was a conscious decision by the Nixon administration to actually facilitate the transfer of manufaturing jobs to low-wage areas. One Nixon-era grand idea was what has come to be known as “trickle-down economics,” the idea that if we make it possible for businesses to maximize profits, they will create more jobs and the wealth will funnel down to ordinary workers. One Secretary of Defense proclaimed that “whatever was good for General Motors was good for the country.” The other grand idea of the Nixon-era economic advisors, which actually worked to some extent against the other big idea, was to take advantage of the advances in technology by fostering the growth of high-technology jobs in the United States while moving the low-skilled production jobs to lower-wage countries and lower-wage states so that the workers there could afford to buy more American-made products. Simultaneously, there was a determined effort to hold down wages for American workers because labor costs are among the easiest costs to control. Wages had increased dramatically after World War II because of union activity in the post-war years to make up for wage freezes during the war. The push for “right-to-work” laws is an on-going part of efforts to hold down wages. What we need to realize is that manufacturing jobs began to be eliminated on a large scale in 1970, when Nixon was president--not after the passage of NAFTA in 1994. Between 1970 and 1974, each of the industrial states in the northeastern part of the country lost hundreds of businesses each year–many to southern states. Wages for American workers began to stagnate in 1970, a quarter of a century before the passage of NAFTA. What has happened to the United States economy since 1970 has also happened to some extent in other First World nations. Germany fared better than most because it took steps to make it expensive for companies to move out of the country–for example, requiring them to fully fund pensions for workers who would be out of jobs, requiring them to repay communities for infrastructure and other expenditutes made for the benefit of the business but otherwise unnecesary to the community. Faced with large up-front costs to make moving the company possible, most decided to stay put. European nations that bought into austerity as the means to recover from the effects of the world-wide economic chaos of the 2008-10 have not fared nearly as well as the U. S., which took a stimulus approach. Japan is among the Asian nations that is having problems similar to our own. China, too, is having major problems now. Trump, at least, woud hae people believe that all of these nations are “beating” the United States in everything having to do with manufacturing and trade–but it simply is not true.